The World Bank president stated today that there is too much debt in the world, and finger pointing has turned toward China for lending trillions of dollars to other countries. This of course does not factor in that much of its holding debt is issued from mature countries, such as the U.S. In the meantime, China and 16 European countries met today in Serbia to discuss trade and trying to pave way for the Belt Road investment project. A Dutch firm’s ASML “chip” technology has been stolen. This comes at the same time when policy makers from the EU and U.S. have voiced concerns over the IP theft from China. An investigation by a Dutch newspaper stated that company secrets were passed from six employees directly to the Chinese government. Elsewhere in Asia, voting closed in India today. The turnout was around 50-60% across the 20 states. There have also been some reports of violence occurring at polling booths. 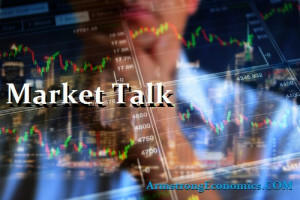 The major Asian stock markets had a mixed day today: KOSPI increased 0.05 points (0.002%) to 2,224.44, SENSEX increased 21.66 points (0.056%) to 38,607.01, NIKKEI 225 increased 23.81 points (0.11%) to 21,711.38. The ASX 200, Shanghai, and Hang Seng took the opposite route. ASX 200 decreased 24.80 points (-0.40%) to 6,198.70, Shanghai decreased 51.97 points (-1.60%) to 3,189.96, and Hang Seng decreased 280.11 points (-0.93%) to 29,839.45. The major Asian currency markets had a mixed day today: The AUDUSD decreased 0.0052 or 0.72% to 0.7119 and the NZDUSD decreased 0.0038 or 0.56% to 0.6726. The USDJPY and the USDCNY took the opposite route and increased 0.6520 or 0.59% to 111.6520 and 0.0113 or 0.17% to 6.7291 respectfully. Both Gold and Silver markets had a negative day today: Gold decreased 17.55 USD/t oz. or -1.34% to 1,292.70 and Silver decreased 0.273 USD/t. oz or -1.80% to 14.9043. Julian Assange, the founder of WikiLeaks, was arrested today in London, UK, over charges of conspiracy to commit computer hacking by the US. He was ousted from the Ecuadorian embassy today after he sought refuge there for seven years. “The charge relates to Assange’s alleged role in one of the largest compromises of classified information in the history of the United States,” according to the U.S. DOJ. If convicted, Assange could face up to five years in prison. The UK is waiting for the Brexit extension decision from the EU. In theory, if this requested extension is rejected, the UK may find itself having to leave the EU with no deal on Friday. The prevailing thought however is an extension is likely up until June 30, as requested by PM Theresa May. The major Europe stock markets had a mixed day today: CAC 40 increased 35.84 points or 0.66% to 5,485.72, and DAX increased 29.29 points or 0.25% to 11,935.20. The FTSE 100 decreased 3.96 points, or -0.05% to 7,417.95. The major European currency markets had a mixed day today: The EURUSD decreased 0.0018 or 0.16% to 1.1255 and the GBPUSD decreased 0.0035 or 0.26% to 1.3055. The USDCHF took the opposite route and increased 0.0012 or 0.11% to 1.0036. Wall Street was rather quiet this Thursday as stocks remained relatively unchanged from the prior day’s session. The Dow lost just over 14 points today (-0.05%, closing at 26,143.05), and the S&P 500 remained unchanged from Wednesday’s session (2,888.32 close). The Nasdaq declined by -0.21% (7,947.36 close), and the Russell 2000 declined -0.15% (1579.14 close). Mortgage rates are slowly rising, according to a report released by Freddie Mac. For the first time in over half a year, mortgage rates have ticked up for two consecutive weeks. The rate for 30-year fixed mortgages averaged 4.12% during the week of April 11, compared to 4.08% the week prior, and 15-year fixed mortgaged averaged 3.80%. Mortgage rates are still relatively low compared to their 2018 average of 4.54% for 30-year fixed mortgages. Unlike economic adviser Larry Kudlow, chairman of the Council of Economic Advisers (CEA) Kevin Hassett publicly announced that he does not support the current administration’s desire to lower interest rates. On Thursday, Hassett reminded the public that it is not the responsibility of the White House to advise the Federal Reserve on fiscal policies. “My job at CEA is to remind people to respect the independence of the Fed,” Hassett relayed during an interview with CNN. On the topic of Brexit, President Trump took to Twitter last night to support the UK and their decision to leave the European Union. “The E.U. is likewise a brutal trading partner with the United States, which will change,” the president ominously added. In a related topic, there are rumors circulating that the U.S. may implement tariffs on EU goods in response to the subsidies the EU placed on the aircraft manufacturer, Airbus. The U.S. urged the UN to officially recognize Guaido as Venezuela’s president. This would revoke the credentials of current President Nicolas Maduro. Vice President Pence stated that the U.S. government will provide $60 million USD in humanitarian aid to Venezuela. More than 50 countries globally have now recognized Guaido as president. The USD Index rose by 0.23% this Thursday (last reading 97.17). The USDCAD rose by 0.37% (last reading 1.3369). The Canadian markets experienced a similarly quiet day. The TSX Composite closed at 16,399.47 (0.02%), and the TSX 60 closed at 979.13 (0.17%). Brazil’s Bovespa declined for the third consecutive day, losing 1,198.75 points (-1.25%), closing at 94,754.70. The IEA report was released, suggesting Saudi Arabia has culled their oil production to the lowest point in the past two years in an attempt to boost oil prices. OPEC wide production fell by 550 thousand barrels per day in March. Most of the oil markets had a negative day today. Crude Oil decreased 1.02 USD/BBL or -1.58% to 63.4623; Brent decreased 0.87 USD/BBL or -1.21% to 70.8425; Natural gas decreased 0.031 USD/MMBtu or -1.15% to 2.6735; Gasoline decreased 0.0428 USD/GAL or -2.07% to 2.0229; and Heating oil decreased 0.018 USD/GAL or -0.86% to 2.0684. Top commodity gainers were Coal (2.21%), Steel (1.96%), and Ethanol (0.98%). The biggest losers were Bitumen (-3.59%), Palm Oil (-3.02%), Cocoa (-2.25%), and Coffee (-4.24%). The above data was collected around noon 15:28 EST time on Thursday. Japan -0.06%(-0bp), US 2’s 2.35% (+2bps), US 10’s 2.50%(+2bps), US 30’s 2.92%(+2bps), Bunds -0.03% (+1bp), France 0.33% (+1bp), Italy 2.51% (-4bp), Turkey 17.19% (+27bp), Greece 3.38% (-6bp), Portugal 1.14% (-3bp), Spain 1.00% (-4bp) and UK Gilts 1.15% (+5bp).